Sometimes you just get Huck Finned into doing something. And in this case, I’m glad I did. Because really, who gets to laugh for two solid months at their job? Huck, I mean my boss and General Manager of the Bozeman Daily Chronicle, Nick Ehli, asked if I was interested in working on a project compiling police reports for a book along with reporter Jodi Hausen. “It’ll be fun,” he assured me. My job was to read 24 years worth of police reports – on microfilm. That translates to 288 months or about 16,540 days worth of police reports. At about 10 – 15 entries on the police blotter each day, that works out to. . . well, a whole lot of reading. Even though I got one new contact prescription and one strange, camel-looking back hump and ate 12 pounds of malted milk balls along the way, I’m still glad I did it. I owe the fantastic folks at the Montana State University Library a huge thank you. I’d especially like to thank David, who patiently showed me how to run the microfilm machines and kept me from a panic attack the day my favorite was permanently moved to storage. I’d also like to thank him for not getting peeved when I would break into laughter. He never shushed me once, even though he probably should have. David, you rock. 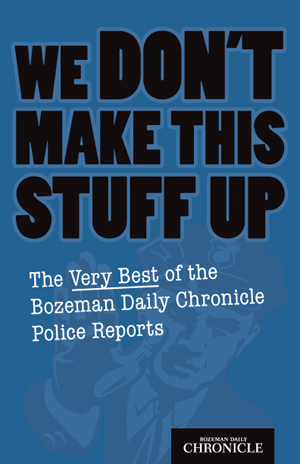 We Don’t Make This Stuff Up – The Very Best of the Bozeman Daily Chronicle Police Reports is proof positive that the truth is stranger than fiction. And that some people are really as dumb as you think. It’s available at The Bozeman Daily Chronicle, Country Bookshelf and Murdoch’s. It’s also available online.